Developed to inform the 2013 National Climate Assessment, and a landmark study in terms of its breadth and depth of coverage and conducted under the auspices of the U.S. Global Change Research Program, Climate Change in the Midwest examines the known effects and relationships of climate change variables on the eight states that make up the region. This state of the art assessment comes from a broad range of experts in academia, private industry, state and local governments, NGOs, professional societies, and impacted communities. It highlights past climate trends, projected climate change and vulnerabilities, and impacts to specific sectors. 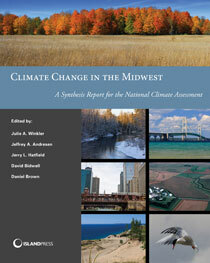 Rich in science and case studies, it examines the latest climate change impacts, scenarios, vulnerabilities, and adaptive capacity and offers decision makers and stakeholders a substantial basis from which to make informed choices that will affect the well-being of the region’s inhabitants in the decades to come. Timko and his staff looked for ways to address Lorain’s existing water issues, which were worsening as a consequence of today’s bigger storms. They needed a large tract of land outside of town for a modern facility that could handle the increasing quantities of rain Ohio is getting. The polluted legacy of the local steel industry meant that Timko had site options. “We looked at brownfields as places where we could achieve multiple positive local impacts,” he said. Timko saw an opportunity for Lorain to shed its image as a former steel town and morph into a place known for “…caring about quality of life.” The “new Lorain” envisioned by Timko would have a treatment plant that released effluent of “nearly drinking-water quality that would have a positive impact on the river, giving clear water to a muddy river,” benefitting fish, and improving Lake Erie. When a bankrupt steel company offered the city 310 contaminated acres of what Timko called “wasteland,” right on the shores of the Black River, he had the key ingredient for his recipe for Lorain’s future success. “Everyone had a reason to support the project. It wasn’t a tree-hugger deal. We were upgrading essential infrastructure, creating jobs, being good stewards of the land by bringing the river back to its 1904 condition and reintroducing species,” explained Timko. “This is how you fix problems in the modern age. You don’t have to have one or the other. You can have both,” he said, referring to what can sometimes seem like a conflict between traditional infrastructure and a nature-based approach. “Someone poorly designed a project if you only have one and not the other.” Having something for everyone allowed Lorain to attract funding from a variety of sources and underwrite different elements of the project. With the assistance of the National Wildlife Federation, the restoration work was designed to prepare for warmer temperatures and increased water volume. For example, fish habitat shelves installed at different depths provide shelter in times of both high and low water levels. Large boulders positioned in the rehabilitated river slow water flow and protect newly established aquatic life, even during big storms. Today, the living wetlands in the floodplain slow and filter runoff. Restored upland riparian habitat replaced the slag pile that used to loom over the eroded riverbank. Schools of fish are returning. A heron rookery is thriving, and nature is taking hold along one-and-half miles of the Black River just above its confluence of Lake Erie. The new Lorain has not yet emerged, but the city now has a large and strategic property to use as the cornerstone of redevelopment, as well as the ideal site for a new treatment plant. Although Timko is no longer with the City of Lorain, his vision manifests in the redeveloped brownfield and a cleaner river. Timko’s strategy of bringing together the supporters of both gray and green infrastructure as part of a climate-smart solution to a variety of urban issues can be a model for many of the Great Lakes’ cities. When the waters rise and warm in the Black River, his legacy will be clear. Download the full report here.